Like your Royal Family large? 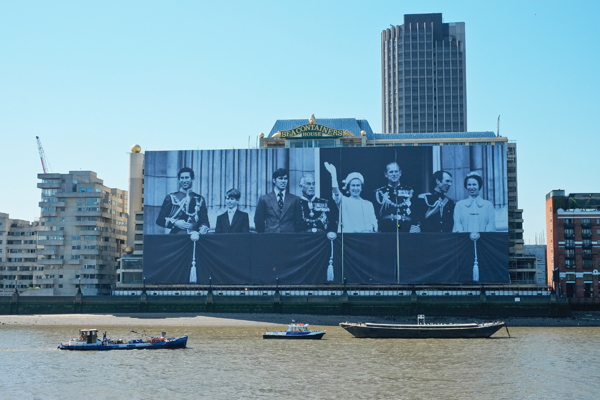 The largest ever photograph of Queen Elizabeth II, her husband, the Duke of Edinburgh, and their four children has been displayed on South Bank building, Sea Containers, in celebration of the Queen’s Diamond Jubilee. The iconic picture of the family – which also includes Earl Mountbatten, uncle to Prince Philip, and Princess Anne’s then husband Mark Phillips – was taken during 1977’s Silver Jubilee by an unknown photographer. The 100 by 70 metre image, which weighs nearly two tons, took eight people more than 45 hours to put into place on the building’s facade overlooking the Thames. It was erected by the owner of Sea Containers as a tribute to be seen during this weekend’s Jubilee Flotilla (and also to hide development work taking place behind as the building is transformed into a Mondrian hotel – Europe’s first – and office space.